Hi guys, I hope you’re all having a great week so far. I am finally getting a chance to upload this street style post (yay). In the last two months I have become slightly obsessed with suits. I’m sure you will have noticed this from recent posts on my Instagram and Facebook page. 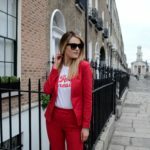 I wore this #GirlBoss red suit to the Littlewoods Ireland SS18 show a few weeks ago and I still can’t get enough of it. I decided to stick with a casual white tee and simple grey courts as the red suit speaks for itself. Have a scroll down and let me know what you think! I have included links to everything below as well. 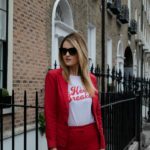 A girl can never own too many blazers, right? I am loving paintbox bright and pastels at the minute and they are a huge trend this season so get in on it while you can. This bold blazer is tailored with a slim lapel, structured seams and welt pockets. It is also light weight which is great for the warmer weather over the coming months. Shop here. 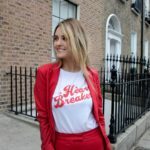 This slogan tee from V by Very caught my eye straight away. 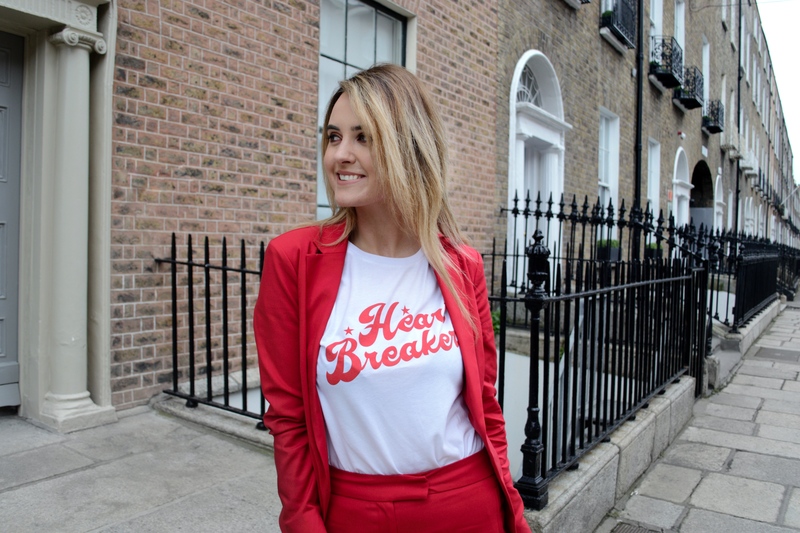 I love the ‘heartbreaker’ design and it is a slim fit tee so it’s perfect for casualwear. I have at least 50 slogan tee’s in my wardrobe and I plan on buying at least another 50 by the end of the year! I can’t seem to get enough of them. Shop here. Of course I needed the pants to match the blazer! These V by Very’s flirty flared trousers finished off the look. The figure-flattering silhouette is fitted through the thighs, before flaring to the lower leg creating lots of volume. How to style? Just tuck in a tee. Shop here. You can’t go wrong with a pair of comfortable courts heels. These court shoes from V by Very are an essential no matter what the season. Their cool grey colourway is complemented by a fuss-free silhouette and pointed toe and pin-perfecting heel. Shop here. There you have it! My latest street style post. I am working on more style posts this month so keep an eye out for more Spring-inspired looks. If there is anything in particular you’d like me to blog about next let me know. You can catch me on Snapchat: duffyloikes, Instagram, Facebook and Twitter!  Shots by Mei Ling.